Okay! Musume Time: Stepping Down from Royal Duties! Houkago Princess Candidates to Graduate! Michishige Saho Prepares for A Study Break! Stepping Down from Royal Duties! Houkago Princess Candidates to Graduate! Michishige Saho Prepares for A Study Break! On May 8th 2017, the two members of Houkago Princesses Candidate section both announced that they would graduate from the group and its programme on June 3rd, 2017. A further announcement revealed that Regular member, Michishige Saho, would be stepping back and taking a 'Study Break' from the group in order to improve herself as a performer. For herself, there was a desire to decline her activities as a Candidate member, and to think of another path to take, rather than continue her activities as a member of Houkago Princess. After much discussion, it has been decided that Horii Nina's final appearance will take place on June 3rd (Saturday), and that she will conclude her activities as a Candidate for Houkago Princess. "I am from Fukui, but for the first time I was able to act as an Idol. It was so much fun to be able to participate as a Candidate for Houkago Princess. I wanted to work hard as an artist and member of the group, but I also wanted to do something different. After consulting with staff members, it came to the decision that I would decline my Candidacy this June. Thank you for your support!" The other day, a diagnostic result for the early stages of an illness came through, and it came to light that it will take time to treat. Because Tanaka Asami was aiming for the Regular members, she thought about continuing her activities, despite the worsening condition of her illness. However, after discussion, it has been determined that she will decline her Candidate position. 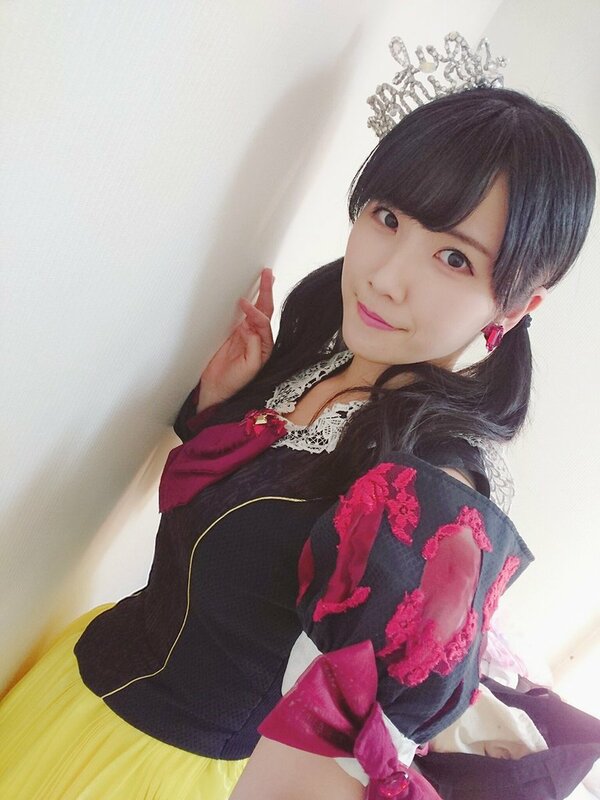 The final appearance will take place on June 3rd (Saturday), and Tanaka Asami will conclude her activities as a Candidate for Houkago Princess. "I am sorry to surprise you with this sudden announcement. On June 3rd, I will decline my candidacy for Houkago Princess, after taking into careful consideration the diseases that have been found during treatment. Because I do not know whether it will be curable, or whether it will deteriorate, this is the best choice. I was working hard to become a Regular member, but struggling during the head-to-head events. I was puzzled at the time, but I wanted to see everyone and finally make an appearance as a Regular member of Houkago Princess. I apologise to the fans and everyone concerned for causing them trouble. I will continue to do my best as a Candidate for Houkago Princess, until the time comes to leave. Thank you." For Michishige Saho, who has been active as a Regular Member since August 2015 (and has been a member of the group since late 2013), the announcement was made that she would be undertaking a 'Study Break' from the group, and would not be active in the up-coming Houkago Princess single release, or any activities tied to it. She has, however, confirmed that she will continue performing with Team Miracle until her return from her Study Period. In regards to her attitude in tackling her activities, and in judging the results for each release, Michishige Saho feels that as a Regular Member, she is not at a satisfactory stage, and can not clear the tasks given to her. Therefore, the following decision has been made, as a wish for the future success and principal of the group. Michishige Saho will not participate in the up-coming single release and public activities of Houkago Princess, and will undertake a Study Period to enhance her skills. However, Michishige Saho will continue all activities as a member of Team Miracle, and will participate in the up-coming Osaka performance. We shall notify fans of any other appearances each time a decision has been made. "As it was announced today, I will be taking a study period for a while. Because of this, I cannot participate in the up-coming single by Houkago Princess. This is because my level of skill has not reached a similar level to the other members, who are steadily increasing as performers and artists. If I can not see the result or effort after, I want to say that I feel grateful for the judgement of the office, who have considered giving me a place here. The other members have tried to persuade me otherwise whilst crying, but the staff have cooperated with this decision I made. I think that I have surprised many people with this sudden announcement, but I would like to continue sticking to Houkago Princess, even as I am now. I will continue my activities as a part of Team Miracle as usual, but this is not a sad announcement. This is my declaration to work harder. Okay, so, in terms of my personal thoughts... well, I'm surprised. I'm also quite sad because, of the two Candidates, Horii Nina is my undeniable favourite, and a member I was waiting to see be promoted into the Regular lineup. To say I feel a little bit sulky right now, is a bit of understatement. I'm more annoyed by this announcement than I am sad, but the sadness will hit me. Just wait till June rolls around, guys. With Tanaka, I am pretty damn surprised. I honestly thought she'd debut as a Regular member, too. Both of these Candidates - the only Candidates, mind - are promising young women. Nina's pretty popular, and her gravure career has been quite successful. Asami, who recently debuted in the Gravure DVD circuit, was also pretty active as a member of HouPri, always attending lives and any other things like Hnadshake events, etc. So, yeah, I really did think that Asami would debut, right next to Nina. Sadly, I feel like Nina's reasons for declining her activities are more to do with her living in Fukui, rather than her wanting to do something else. She can't make a lot of the performances or handshake events due to being so far away from Tokyo, and I don't think she plans to move. I think that's why she mentioned 'I'm from Fukui' in her comment regarding her decision to leave the group. From her message, however brief it might be, though, I think that Nina's going to graduate without regrets. I truly think she loved being a member of Houkago Princess. In regards to Tanaka Asami, I feel like I don't believe her reasons all that much. There are many Idols who site illness as their reasons for leaving, however, we see them in other groups later on, or doing something else. So, yes, I am sceptical of Asami's reason behind graduating. That said, if she really is ill (and from the Staff comment, I think it may be so; they seem to have seen her diagnostics report, from how they have phrased everything), I do hope for her to get better and work on looking after herself. She really has worked hard since joining Houkago Princess at the very beginning of January, and I feel like she loved every moment of being an Idol. She did not slack off or take off days. Asami was always present, so I don't doubt her love for performing and wanting to be an Idol. But, if she ends up in another group come next year... Yeah, I will be a little pissed (lol). I just hope that Asami gets better, and that she works hard in whatever she pursues next. The same goes for Nina, and though I don't want her to be added to another group, if she does, I'll be fine with it. She's a wonderful girl, and very deserving of being an Idol. And yes, you know me; I will miss them both, Nina especially. She was my little HouPri baby, after all. And then there is Sahochi. When I read the tweet regarding her decision to go on a break, I was heartbroken, of course. Of all the members, Sahochi has a special place in my heart. She tends to fluctuate between the #1 and #2 spot with Mayumin, however, Sahochi is someone I adore and look up to as an Idol. I think she's a wonderful young woman, so of course, the news that she will be taking a Study Break is... well, I didn't expect it. But, it's better than her Graduating. So, there's that, I guess? I mean, I don't see it. I don't see how Sahochi could think she was below the other members in talent. Of course, I understand that as an individual, how she views herself is different to how her fans and the other members view her, so she probably does think that she is honestly not as good as others. But from my perspective, Sahochi is just as wonderful than the others. She is not the best, but she is amazing, regardless. She always does her best, and is smiling radiantly through every performance. This is the decision that has been made, however, and though I want to see Sahochi in the next single beside the other members, I can't. All I can do is wait for her return, and hope that she sees herself improved enough to come back and take the stage again. I wish Sahochi luck, and I hope that all of the fans will support her decision and await her return with patience. This news is not what I wanted. It is news that no one who loves any Idol group or artist wants to hear. We love these girls and treasure them, and we want to see their smiles from across the stage or on-screen. Because two of these Idols are two I adore greatly from a group I love with all my heart, I am deeply saddened. However, I can only wish them the best, and hope that I see Saho's glittering presence back on that stage again beside her fellow Houkago Princess members. Until June 3rd happens, we should treasure the last moments we have with these three girls. They are going to create beautiful memories for us all, and deserve our undying support. For now, everyone, take care. Love your Idols for as long as you can. Don't let the sadness overtake the memories and happiness that Idols provide for us all.